Why SocraTec R&D for your phase-III trial? We are a mid-size CRO – this is an advantage as well as a limitation. Your trial is in our focus – our team will be completely dedicated to your aims with close and rapt attention and will work at a very high level of commitment. From design development to reporting – we are a full-service provider for your phase-III trial. For multi-national studies we co-operate with locally active and highly motivated monitoring service providers all over Europe. We generally offer and recommend a very thorough feasibility assessment to make sure that there is a good chance of recruitment success. 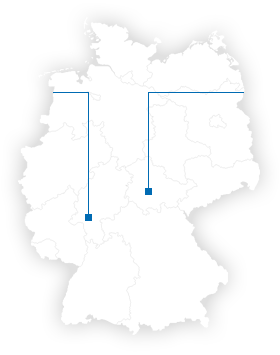 Based on very intensive networking including specialised German centres covering the above indication fields in Thuringia, Saxony, Bavaria, Hesse and Berlin, we are able to ensure top recruitment rates as compared with other CROs. in case that other contries than Germany shall be included in a trial we co-operate with international partners world-wide. Our experts accumulate long years of experience with different institutions to identify the most suitable solution for our clients.